I really enjoyed this movie. It made me laugh a lot, it almost made me cry a couple times, and it did make me cringe a few times. Birders, brace yourselves to field questions from the non-birding public about the intricacies of the eccentric culture of birdwatching after they watch "The Big Year". There really are some funny scenes and jokes...even more than were in the trailers...thank goodness! (Don't you hate it when all the good scenes were in the trailer and the rest of the movie tanked?) While we watched "The Big Year" people all around me were laughing, not deep belly laughs, but continuous simple pleasure chuckles throughout. The newlywed couple - the excited and eager birding husband and non-birding bride - honeymooning on Attu was a particularly funny scenario. Birders and non-birders will enjoy the comedy in the movie, though birders might enjoy the jokes on a different level. It was fun to laugh at myself and I hope you can laugh at yourself too. Many of the personal story lines are moving...sometimes troubling and pitiful...other times heart-warming and nearly tear-jerking. This is a story about passion and obsession and all the good and ill that can come from it. At times I wanted to box Kenny's ears for screwing up his marriage with a perfectly good and loving wife. The relationship of Stu with his entire family, and that between Brad and his parents were especially keenly felt and appreciated. My non-birding wife could really relate to the non-birders as shown in the film. She laughed at some things and more than once pointed out other scenes saying "That's just like you." She even gave me an earful of threats of "If you ever act like...!" Most of all it reminded me that my family is much more important in my life than chasing birds. Birding is fun and you don't have to sacrifice relationship to enjoy it. As an avid birder, what made me cringe? The ever so lovely Rashida Jones doing bird call imitations - kinda charming to the story line, but kinda tough to watch and worse to hear portrayed on the big screen. I'd rather have seen her use a smartphone app to play the calls while challenging Jack Black's character (Brad) to correctly identify them. Oh, that reminds me, they never showed the fine art of "pishing" which would have been perfectly teed up for a cadre of jokes. The Hitchcock-like gull attack on the non-birding bride honeymooning on Attu was funny, but still gave me those conflicting gut feelings that I didn't want to feel. The montage where the various bird sighting locations are labelled on a scenic Attu fly-over was really hard to watch as a birder, simply because of the wrong habitats and species portrayed. Another thing that irked me just a bit was the androgynous bird-blogger with the lame bird-blog title whose sole purpose was to worship top birders and perpetuate rumors in the birding world...Oh wait! I do that too...except for the androgynous-ness and lame bird-blog title part. Speaking of that internet topic...in today's world of online rare bird reports...does anyone still call into NARBA with a password? I guess I've been left out of that loop. The computer generated bird images were sometimes a bit too fake for my liking, but non-birders may not even notice that their behavior isn't typical. Perpetual listers that we birders are, I'm sure we will soon see all kinds of lists from the movie - all of the birds seen and heard...and lists of all the bird errors - incorrect habitat, incorrect calls, incorrect species identification, etc. I'm okay with that. I think movie errors are kinda fun. But don't let the bird inconsistencies get you all bent outta shape about the overall movie. Another thing I liked about this movie is that it showed minorities involved in birding. There was a grumpy Asian lady depicted in Attu, a black birdwatcher gentleman who showed up at all the big birding sites, and a black woman youth "explorer" leader. I'm a big fan of the work being done by John C. Robinson and Outdoor Afro in "giving permission" to minorities to get outdoors and enjoy nature and birding. I think this Hollywood portrayal will subtly help invite people of color to enjoy the color of nature. 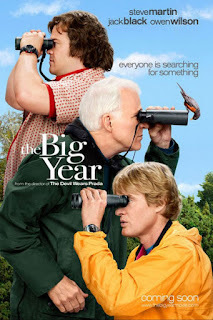 "The Big Year" movie did a fine job capturing the fun and awe inspiring nature of birds and birding. Birders and birdwatchers were shown to be quirky, but loveable; from all walks of life and respectable. Some birders are shown that really enjoying the birds, more than just playing the game of birding. The scenery alone was fantastic and gave me rush. I was left wanting the movie to share more of the excitement and thrill of birding, but that is just me...an enthusiastic birdwatcher. I hope "The Big Year" does lead to greater public awareness and interest in birding. I believe it will. My non-birding friends that attended with me loved the movie and the story line. While it may not convert them into birders, they sure had a ton of curious questions about the eccentric birding culture...which is a great start in welcoming them into my world...the wonderful and fun world of birding. I just got home from our midnight showing and really enjoyed the movie. I do agree on the dorky bird calls. An iPod with a bird app would have been much more accurate. I enjoyed your review-nicely done! I liked the line-"I think this Hollywood portrayal will subtly help invite people of color to enjoy the color of nature." It would nice to see more diversity in the field. Good review, we're seeing it today. Great review Robert! I just saw it myself. I give it a thumbs up! Enjoyed your review, Robert. Saw the movie last night and enjoyed it immensely. Thanks for the review! I'm heading out this afternoon to go watch it. Had dinner with a bunch of Audubon folks from Lincoln City last night followed by going to the movie together. We sat at dinner with a couple who had been with them on Attu in 1998 - it was great getting their stories before the movie! And we loved the movie (all the reason you give in your blog). The birders were still sitting watching ever photo flash by at the end when the rest of the folks were long gone! Oh, and my non-birding hubby was up late looking up various places and references long after we got home. It was fun! Thanks for the review! It's interesting seeing the film from a birders point of view. As someone who knows next to nothing about birds, I thought the CG-created birds were pretty good. It was only the woodpecker (Black spotted woodpecker? The one they see after the car crash) that I noticed some unnatural movements. Hey everybody, im not a birder but i liked the movie. i am agree with the non-typical behavior of the CG birds, as a 3D artist i can tell i have "the eye" to see when something dosen´t move like it should in the real world. I though "oh, this is a animated 3D bird"